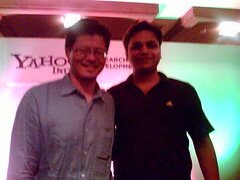 Jerry Yang, who co-founded Yahoo! with David Filo, visited Y! Bangalore with Yahoo! CEO Terry Semel and CFO Susan Decker. This entry was posted in General, Yahoo and tagged Bangalore, Blogs, India, Yahoo. Bookmark the permalink.